Taking pride of place as the northernmost region of Italy, the South Tyrol lies at the feet of the Dolomites, bordering Austria to the north and northeast, Switzerland to the west and the rest of Italy to the south. Once part of the Austro-Hungarian empire, the Alpine South Tyrol – or Alto Adige in Italian, Südtirol in German - was annexed by Italy in 1918. The region’s blend of cultures is ever-present, revealing itself in German-influenced frescoed wooden chalets, scarlet geranium-filled window boxes and lashings of apple strudel. Locals speak Italian, German and a small percentage, the local Ladin dialect. For outdoor and foodie enthusiasts, the region is a dream, ideal for skiing and snowboarding in winter, hiking and biking in the summer, and with breath-taking scenery, superb wines and a unique cuisine. 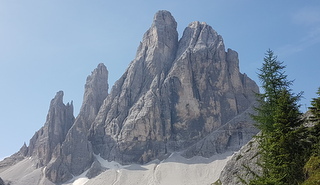 With 12,500km/8000 miles of trails, 7 national parks, snow-capped UNESCO designated mountains and a landscape of lakes, mountain streams and waterfalls, hiking is the number one attraction, with high points including the Tre Cime in the Sesto Dolomites. 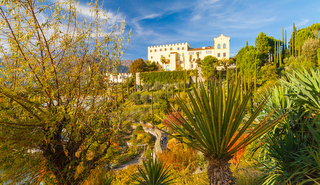 Castles worth visiting – and there are reputedly 800 in the region - include the 11th century Tyrol Castle near Merano, which has a lovely courtyard, Romanesque portals and frescoed chapel and is now the headquarters of the South Tyrol Museum of History. In the west of the region, Lake Reschensee is famous for its submerged 14th century church tower while slightly further south, Churburg Castle, above Sluderno, is an imposing Renaissance castle and one of the best preserved of South Tyrol. The region’s Austrian heritage is responsible for a cuisine that is markedly different from the rest of Italy, but which offers some serious gastro treats. 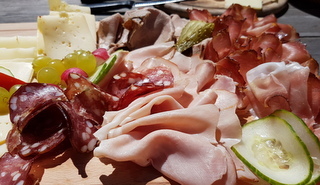 Tortelloni and Knödel (or ‘Canaderli’) feature on the same menu and mountain huts serve up family-sized platters of cheese and speck ham, washed down with sweet apple juice and finished off with melt-in-your-mouth strudel. However, this is also a region that boasts a disproportionate number of Michelin-starred restaurants. While much of the wine in the region is produced by cooperatives, the number of independent producers is growing. Varieties of Riesling, Sylvaner and the aromatic Gewurztraminer are leading whites, while reds include Schiava (Vernatsch) and Lagrein, Merlot and Cabernet. 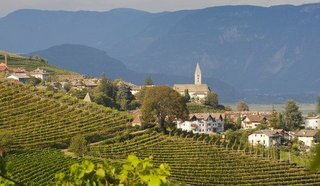 Top wine routes include the South Tyrolean Wine Road and the many wineries around the spa town of Merano. The regional capital of Bolzano has more of an Italian feel than the rest of the South Tyrol: pizza and aperol spritzes sit happily alongside beer and bratwurst and the city features some excellent restaurants. 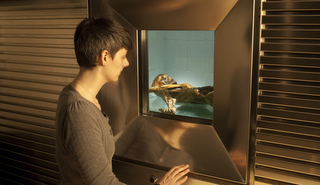 Several of the city’s museums are well worth a visit, including the Museum for Modern and Contemporary Art and the Museum of Archaeology which is home to the 5,300-year-old Otzi frozen man. Should you tire of city sights, head out to beautiful Lake Caldaro or take the Bolzano-Renon cable car for superb views of the Dolomites. The Plateau Renon features some stunning summer homes and is also the starting point of several excellent hikes. 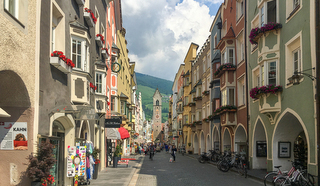 Merano is also an attractive town, with medieval arcades, tiny streets and painted buildings. Take a pleasant stroll along the Passiria river or visit the Trauttmansdorff Castle’s wonderful botanical gardens. Vipiteno is the northernmost town in Italy, dating back to the Middle Ages. The alpine town has an imposing clocktower (Torre delle Dodici) and pedestrian roads lined with sugar almond-shaded buildings that are home to shops, restaurants and houses. Other towns to check out include the typical South Tyrolean village of Chiusa, with its pastel-hued houses, and the attractive mountain village of San Cassiano. In the Val Pusteria, Sesto is popular with climbers and renowned for its views of the Tre Cime peaks. Close by, the pretty town of Brunico has a castle which dates back to 1250 and now houses an exhibition that forms part of the museum project created by Italian mountaineer and extreme climber, Reinhold Messner. 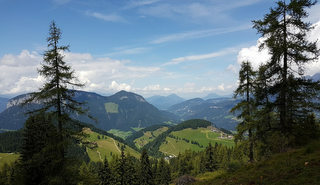 The region is best known for its traditional Christmas markets but during the summer, a series of wine-related celebrations pop up across the region, with the principal Festa in Vino taking place in the sixteen towns along the South Tyrolean Wine Road from mid-May to mid-June. Bolzano’s Jazz Festival during the first half of July brings internationally renowned artists to the city to perform in a variety of open-air and indoor venues. Dates and further information are available from the Sudtirol Jazz Festival website. 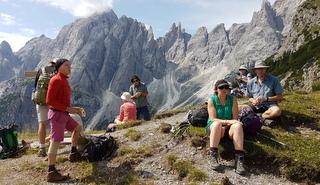 Our Austria and the Dolomites tour travels from Innsbruck to Verona, incorporating some spectacular alpine hiking and exploring the attractions of Bolzano. If you wish to take a tour in a neighbouring region, and extend your holiday with a stay in the South Tyrol, we recommend our Slovenia and Friuli tours or our tour of the Italian Lakes. International flights are available to Verona (90 miles from Bolzano), Innsbruck, Milan Malpensa and Bergamo. 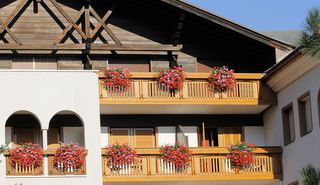 Further information on the region from the Trentino-Alto Adige tourist board.